Whistle Down The Wind booking now open. Long Eaton Operatic Society. – East Midlands Theatre. Whistle Down The Wind booking now open. Long Eaton Operatic Society. 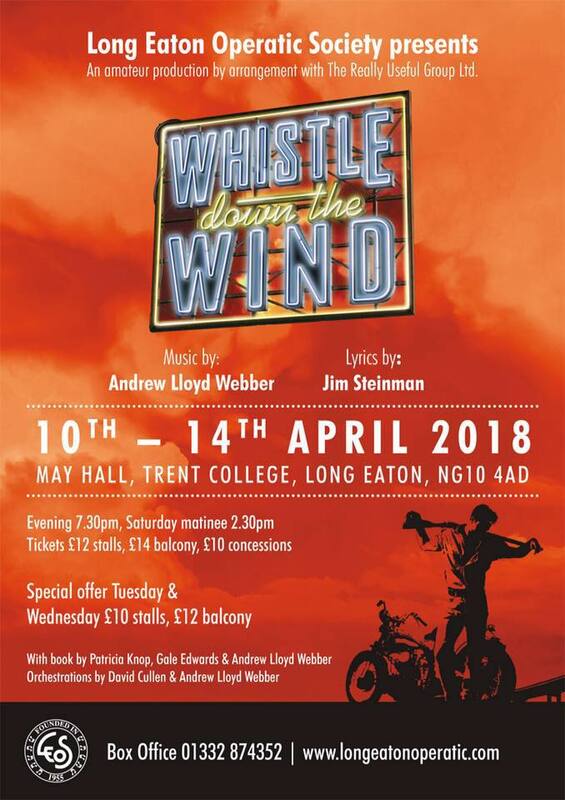 Whistle Down The Wind is a very popular musical composed by Andrew Lloyd Webber who also wrote the book with Patricia Knop and Gale Edwards, The lyrics were written by Jim Steinman. It is based on the 1961 film of the same title which was based on the novel written by Mary Hayley Bell in 1959. The last time it was seen was on a UK tour in 2010 so book now to assure yourself of seats as this one looks to be highly sort after. The show features well known songs such as The Vaults of Heaven, Whistle Down The Wind, When Children Rule The World and No Matter What. Kathryn McAuley directs. Welcome to our new co-reviewer – Kathryn McAuley.